2015 Mini Clubman Concept revealed | What Car? This is the Mini Clubman Concept, which previews a much larger successor to the current model that is expected to go on sale in late 2015. The Clubman Concept is the longest and widest car that Mini has ever made. The Countryman SUV is taller, but this new estate concept is 9cm longer and 5.5cm wider. The show car takes most of its styling cues from the latest Mini hatch, including the elliptical headlights, wide chromed grille, gloss black pillars and ‘floating’ roof. Polished chrome 19-inch alloys sit under the wheelarches, while the most significant exterior feature is a pair of full-sized rear passenger doors, rather than the solitary half-sized affair that's on the current car. This change, along with the bigger chassis, means there are now three seats in the back. At the rear, the concept keeps the familiar cupboard-style boot doors. These are much larger than the current production Clubman’s, though, and the opening now runs all the way to the roof. Even the rear spoiler splits in two, which creates a larger gap for loading. The concept is similar in size to the Seat Ibiza ST, so we’d guess boot space is around 400 litres. The Clubman Concept also gets a split-level load floor. Like the Mini Paceman coupe, the Clubman Concept adopts a pair of chunky horizontal tail lights and spaced-out chrome inscription of the model name. Centrally mounted twin exhaust tailpipes under the rear diffuser complete the look. The cabin is something of a smorgasbord of luxurious materials. The seats are covered with a mix of black nappa leather and light blue nubuck leather, which extends onto the steering wheel, gearbox lever and central armrest. The top of the dashboard is coated with stretched black leather, and incorporates a large central instrument display as well as four air vents. The air vents - as well as the gearshift paddles for the automatic ‘box - are coated with patinated silver, which gives them a tarnished appearance. The elliptical surround of the fascia is made from blue limed Ash wood grain, which also appears around the edges of the partition between driver and passenger, as well as in the door panels. The lower half of the dashboard is covered with high gloss dark red patent leather. 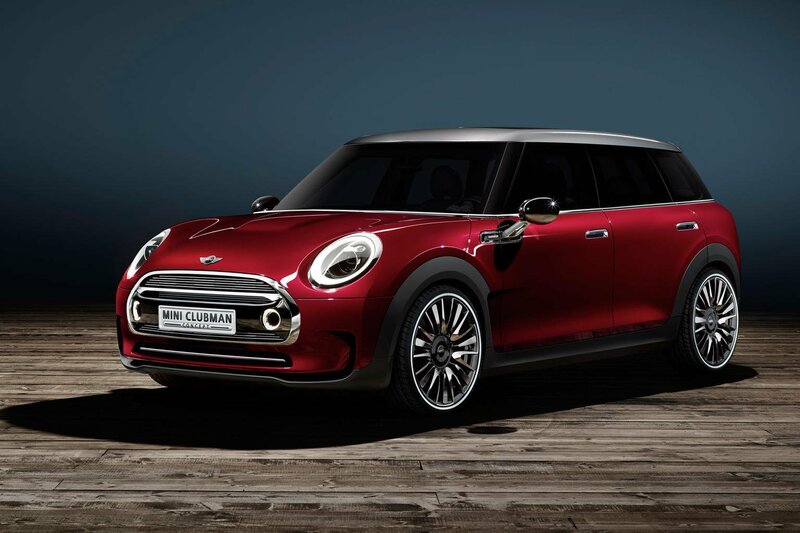 The Clubman Concept is officially just a show car, but Mini plans to replace all of the current model variants with versions based on the new hatchback. That means that this concept shows what we can expect from a more practical Clubman, based on the latest chassis, when it is launched in late 2015.